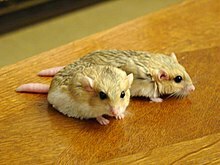 The fat-tailed Gerbil is Pachyuromys duprasi, a species of gerbil. Its tail becomes fatter when it eats something. Then it uses it when food becomes scarce. They can live 5 to 7 years in captivity. It is from Africa. They can survive a long time without drinking because they are adapted to a dry climate. They bury themselves under the sand until night so that there are not as many predators that will attack them. This page was last changed on 19 December 2014, at 11:32.